Markos Giannopoulos posted a great article in his blog, Tracking writing goals: Scrivener + Dropbox + Beeminder. His is an excellent way to track word counts from iOS Scrivener if iOS is all you use—but as Mr Giannopoulos notes, the word counts will be higher than true. That’s because all the files Beeminder will be counting are RTF files—which contain formatting information that Beeminder will happily include as words you wrote in addition to the real words you wrote. If you have either Windows or Mac Scrivener, and you’d like a truly accurate count Beeminded (almost) automatically, read on. This technique uses the External Folder sync capability of Mac and Windows Scrivener (available in the Windows version since the release of iOS Scrivener) and Dropbox—independently of iOS Scrivener sync. I tried to use Google Drive, but was unable to get word counts through to Beeminder. Sadly for iCloud Drive fans, I couldn’t even get iCloud Drive started. Is this technique any easier or more accurate than always compiling a plain text version of your project whenever you’d like to update your Beeminder word count (as Mr Giannopoulos also suggests in his post)? If you don’t often add new text documents to your project, and you usually close your projects, then my technique can automate tracking accurate word counts via Beeminder. If you add a new text document or three daily, or you leave your project window open for days, compiling to plain text may work better for you. How to set up an External Folder sync to Dropbox that will contain all and only the Scrivener files (in a particular project) that you want to Beemind. How to add those files to a new goal in Beeminder. How to Beemind any new Scrivener files you may add to your project and want to track in your existing goal. 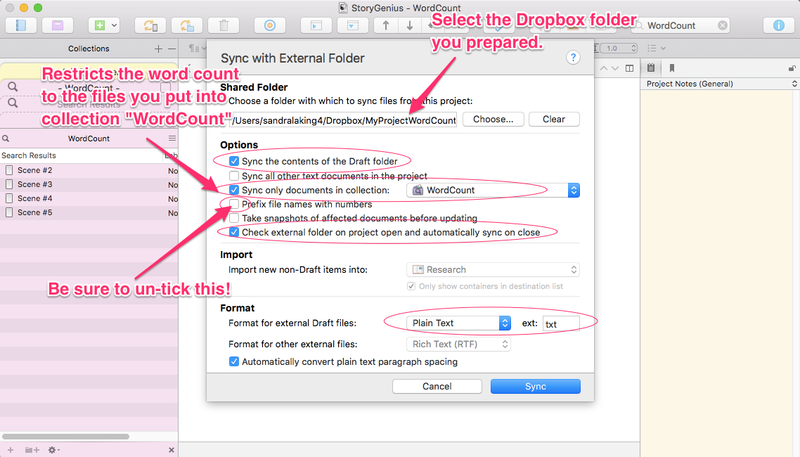 First of all: If you’re using Dropbox to sync with iOS Scrivener—this is completely separate. Don’t use the folder you use to sync with iOS Scrivener for this. ANY other Dropbox folder will do. Filename caution: Once you start Beeminding a text in your Scrivener project with this technique, changing its name inside Scrivener will break its Dropbox link. You’ll need to fix the link in Beeminder to keep your word count accurate. To make this work, you’ll need to have the Dropbox app installed on your Windows or Mac computer. This will put a “Dropbox” folder on your hard drive. That’s the place you’ll be telling Scrivener to sync with. Make a new folder somewhere in your Dropbox folder (that isn’t where you sync iOS). I suggest you name it something obvious like BeeminderWordCount or MyProjectWordCount. Open your Scrivener project in Mac or Windows Scrivener. Consider the documents you want to Beemind. If it’s just all the text documents in your draft folder, great! Otherwise, I suggest you decide on a keyword for the texts you want to Beemind (“WordCount” or whatever you prefer) and assign that keyword to the texts you want to count. Click the “Choose…” button and select the folder you set up in step 2. If you’re using a keyword search collection as in Step 3.A, tick the “Sync only documents in collection:” box and select your search collection from the dropdown menu. Make sure the “Format for external Draft files:” dropdown has “Plain Text” selected. This is what’s going to make your word counts more accurate. CAUTION: Do not tick the “Prefix file names with numbers” box! This option prefixes numbers to the text filenames in Dropbox to show their position in the Binder. That might cause several file name changes in Dropbox every time you moved a file within your project, breaking many Dropbox shareable links. You’d then need to update those links in Beeminder to keep your word count accurate. Tick the “Check external folder on project open and automatically sync on close” box. This is what’s going to make updating the Beeminder count (almost) automatic. Finally, click the “Sync” button. Your sync is now set up, keeping plain text copies of the files in the folder you’ve set up for Beeminder to count. 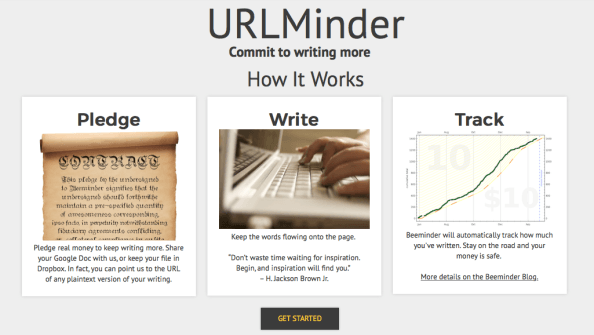 Go ahead and start your goal in Beeminder, using URLMinder as your data source. You’ll come to a page with a place to insert URLs for Beeminder to track for word count (see right or above.) In a fresh browser window or tab, open Dropbox.com. In your browser, in Dropbox.com, navigate to and open the folder you created in Step 2 of “Setting Up External Folder Sync for Beeminder” above (EFS for short). You’ll find a folder inside named “Draft.” Open that “Draft” folder. Return to the Beeminder page and paste the “sharable link” into the URL list box. Be sure to tap “enter” after each one. Now you have a list of the texts you’d like to word count, each separated from the next by an “enter.” Go ahead and finish setting up your Beeminder goal. You’re done! Be sure to close your project or choose “File > Sync > With External Folder Now” in Scrivener each day to log your word counts to Beeminder. One of the joys of Scrivener is the ability to break the stuff you’re writing into small chunks so that the text never gets overwhelming. But that means adding a file, which means adding another file to the list that Beeminder tracks. I wish that I could tell you that Beeminder will automatically start counting new text files that appear in your EFS folder—but it won’t. It only monitors individual files. So whenever you add a new text to your Scrivener project that you’d like to have counted, you’ll have to add it to the URL list that you created when you set up your goal. First, if you’re using a keyword search as in EFS Step 3.A, be sure to add the keyword to your new file(s). After you close your project (or choose File > Sync > With External Folder Now), the new file(s) will be added to your EFS folder. From there it’s pretty easy—just go to the “Settings” area of your Beeminder goal and scroll down. You’ll find the URL list there. Follow Step 4 above to add your new URLs to the list. But—you will need to remember to do this for every new file you want counted. (This is the other 10% of the “90% automatically”.) But if you were doing this in any other writing software you’d still have to remember to add new files unless you kept your work in a monolithic plain text file. That’s it! Happy word count tracking!